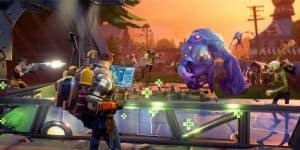 Fortnite Now Has PS4 and Xbox One Cross-Play | Nerd Much? We only just broke through with Minecraft, and now Fortnite? Discovered by fans of the game, it seems that Fortnite was enabled for cross-play between the PS4 and Xbox One over the weekend. There has been no announcement whatsoever from Epic Games, before or after the event. Hopefully we will hear more details tomorrow and this isn’t just a happy accident. The cross-play was confirmed by fans on Reddit who recorded several incidents through video and images. There’s even an official subReddit for those are finding more and more Xbox One and PS4 friends while playing. Fortnite does officially allow cross-play between PS4 and PC, but it is rare indeed to find a game that has cross-play between the two major consoles. I believe we only just broke through with Minecraft, and though Microsoft is keen to show their enthusiasm about the negotiations, Sony has been consistently silent on the matter. Hopefully this will last as another breakthrough for cross-console play, at least between the PS4 and Xbox One. Fortnite and Minecraft may seem like small steps, but it counts if it makes those sales numbers go up. The next games could be the really big ones, like Destiny 2 or Call of Duty: WWII. There are plenty of gamers out there who just aren’t buying certain games because the people they’d play with are on a completely different system. That said, we’re not sure how technically possible it is for games, like Fortnite, to have cross-play between the consoles. It seems like just a switch that needs to be turned on, but that might not be the case. There might be a lot of behind the scenes development work going on. Or it’s just a block on the network that needs to be turned off, the internet is global and free, after all. There is nothing stopping the average user from visiting foreign networks on a PC after all, except perhaps certain networks based in particular countries for particular reasons we’ll not discuss here. What games would you like to see on cross-play between consoles and why? Let us know in the comments below!